The great Chuck Morgan showed off a new Stop The Wave sign during last night’s game against the Marlins. 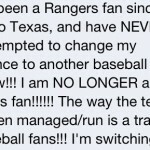 Of course, with how the Rangers season is going right now this one is a little bittersweet. 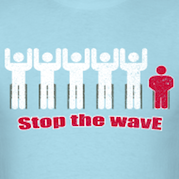 Oh, and while this particular wave was going on the Marlins scored two runs because of course they did. When did going to a game become such a beating? I love going to baseball games. Being in a stadium and watching a game in person is just a better experience than watching it on TV. Or, at least it’s supposed to be. One of the problems, for those of us who care about the actual game, with becoming a popular team is that it attracts people who just want to do the current cool thing. 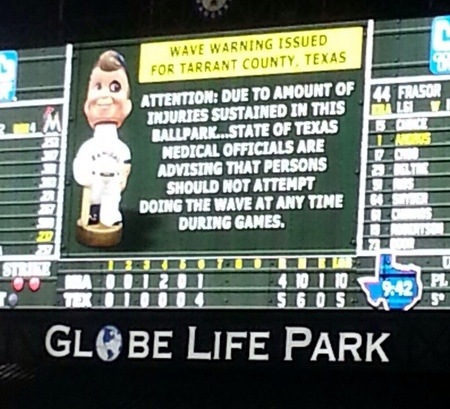 That tends to make the ballpark a less than ideal place to be for someone who just wants to watch live baseball, especially in a fair-weather area like DFW. Them wanting to go “teach a lesson” to someone wearing a Seahawks Russell Wilson jersey because that just shouldn’t happen in “our” stadium. Every other word being a f-bomb. I curse, a lot at times, when I’m around friends that I know don’t care. I’d never be crass enough to yell it to my friends with hundreds of strangers around. How running on the field was on this guys bucket list and he just had to do it. How he was afraid his dad would kick him out of the house because bail would be so much. Trying to get a friend to do it with him saying he would pay their bail. These last two seem to contradict each other. How he’d had 7 beers already so he wouldn’t feel a taser, but he needed one more before he did it. 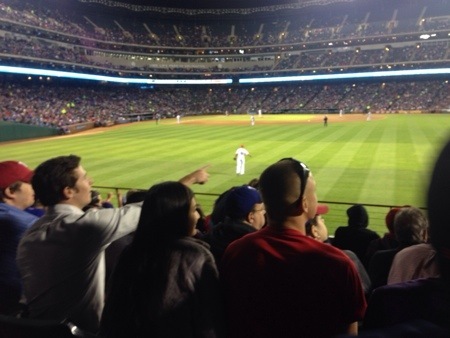 That was when my fiancée and I left those seats and found somewhere better to watch the last two innings of the game. Yep, they’re watching and cheering, very loudly, for the wave they were trying to start. I know this sounds like some old man complaining. But at what point are people being jackasses and taking away from the enjoyment of people who want to watch the game too much? Going to games means too much to me to just stop doing it entirely but it may become something I do less frequently as the season goes on. And that makes it worth it. 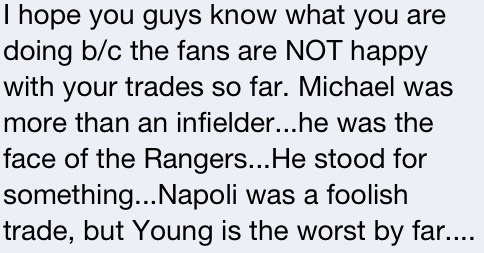 As everyone knows by now, the Rangers did something that really needed to be done over the weekend and traded Michael Young. It’s a move that’s going to be good for the Rangers, Young himself and, if MY rebounds even a little bit from his disastrous 2012 season, the Phillies. However, even with the deal being a good move for the team it was still a bittersweet day. 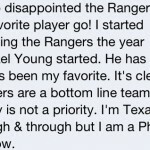 I’ve been pretty unapologetic in my criticism of Young’s play, especially on Twitter, but I understand and appreciate what he’s given to the Rangers over the past 12 seasons. 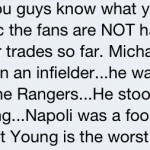 It will be very, very strange not hearing Young introduced on Opening Day. 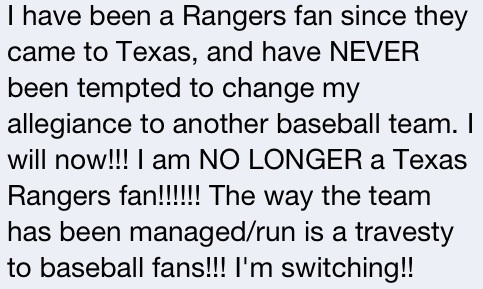 But, this move makes the Rangers a better team next season and that’s what’s most important here. Of course, not everyone sees it that way. And what better way to see how people feel than taking a look at Facebook? 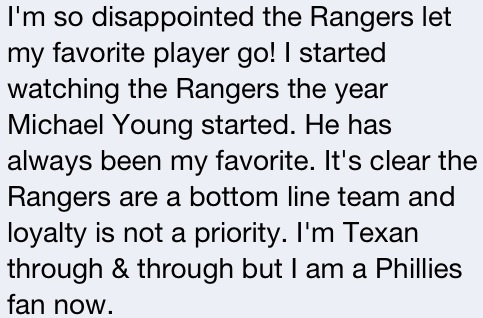 The official Rangers Facebook page hasn’t posted anything about the trade yet, probably in part so their social media guy doesn’t have to deal with moderating the comments on it. That hasn’t stopped people from sounding off on other posts though. 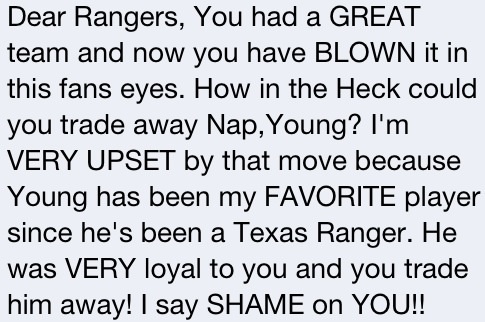 So, presented without comment, a selection of Facebook reactions to the MY trade and the Rangers offseason in general. I’ve removed any identifying info but these are all actual comments. 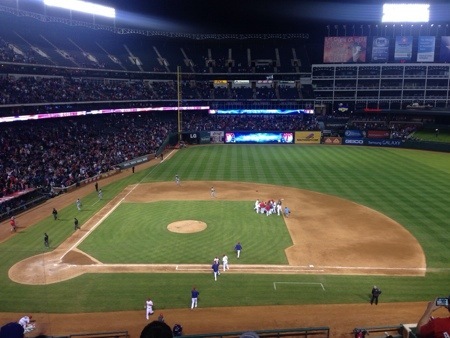 I’ve been working on a post for later tonight about how tough it’s been watching Rangers baseball at times this season. Winner expectations, a divide in the fan base, a stubborn manager, questionable media. That type of stuff. 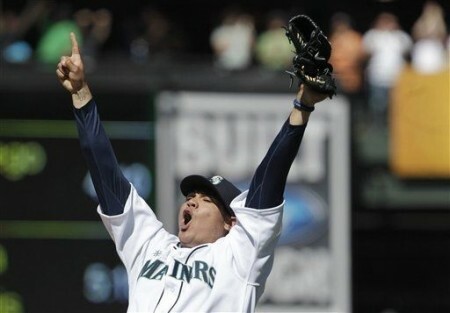 But then, Felix Hernandez goes and throws what might be the best perfect game ever and all of a sudden you’re reminded why baseball is fun. So, yeah, that other stuff can wait a few more days. 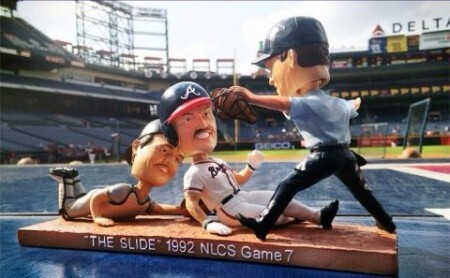 On Saturday, June 9th, the Atlanta Braves are giving out the greatest bobblehead ever created. As I’ve mentioned before, I grew up in Atlanta until 1996 and was naturally a huge Braves fan. After an entire decade of terrible baseball in Atlanta the Braves had the World Series stolen from them thanks to questionable Metrodome conditions and blatant cheating by the Twins lost the 1991 World Series to the Twins in seven games. (Last season the Twins released a bobblehead featuring an infamous, to Braves fans at least, incident during game 2 of that series.) No one really expected the Braves to make it back in ’92; much like long time Rangers fans people were just conditioned to the Braves losing. 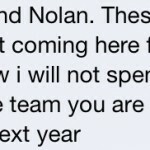 However, there they were back in the NLCS against the Pittsburgh Pirates, down 2-0 in the bottom of the ninth of game 7. Good things happened and Sid Bream, quite possibly the slowest man on the planet at the time, beat Barry Bonds throw and the Braves were back in the World Series. Unfortunately, The Braves would go on to lose the World Series to the Blue Jays in six games (they wouldn’t get back until 1995, when they finally won) and the Pirates haven’t had a season above .500 since. I remember watching that game live on TV. As a 10 year-old baseball fanatic it was quite possibly the greatest moment of my life up to that point. I really want one of these things but since I’m in Dallas now and can’t get back to Atlanta on such short notice I need some help. If you can in any way help me get one please get in touch with me and let’s work something out.